“Those were the days my friend; we thought they’d never end,” Canadian singer Brian Roman sang for the first time in a public performance. But Mary Hopkin’s festive melody that has endured the test of time epitomized the diverse performances given to the East County community by Grossmont Community Concert Association over the past 70 years. And in its closing act on June 15, the GCCA showed, once again, the beauty of what this organization has provided its community for decades. The GCCA held its farewell concert, featuring Roman, at the Joan B. Kroc Theatre, and ended years of bringing its visions of the arts for all to East County, and although it was the last concert, it was a celebration of an organization that has made its mark in East County. “We’d live the life we choose” –and that they did, with a humble but empowering beginning in 1947 by a group of individuals who wanted to bring diverse musical groups to the East County, adding to its culture and giving many people a first chance to experience fine musical arts. GCCA’s first concert featured mezzo-soprano Mona Paulee, accompanied by her pianist in 1947 at Grossmont High School. Over the years the GCCA offered a wide variety of music, dancers, vocalists, and contrastive performances. China, Dublin, Puerto Rico, America, and a wide variety of artists from the world performed under the umbrella of the GCCA, and at its peak its membership swelled to more than 1,200 members. Volunteer and musician Bobby Simmons said that the grand finale show was “bittersweet,” and his sentiment resonated with many others that attended. Eldonna Lay, El Cajon Historical Society curator at the Knox Museum said that the GCCA took a “leadership role” with the diversity of art that it provided to the region, and the value of the performances given to the community were undeniable. Along the way GCCA added committees, began working in the community philanthropically, joining forces with Grossmont Junior College, and played a large role in the creation of the East County Performing Arts Center, which stayed GCCA’s home until it shut down, then moving to the Joan B. Kroc Theatre. Changing times, tastes in music, and the ease of entertainment reduced their numbers to around 450. Members passed, other had difficulty in traveling, and the once thriving group had difficulties bringing in younger members to take over the helm and vision of the GCCA. Even though its outreach performances, Live on Stage San Diego, which cultivates and sponsors performers tried to maintain their vibrancy, the GCCA decided to leave East County as stylishly and humble as it began. Past and present board members such as Carol Weiss, Margie Howard-Hartman, June Green, Patricia Parlin and others ultimately resolved how to end the association—with a grand finale performance. GCCA had enough in its coffers to keep going for at least another year, but the members came to a consensus that the monies would better serve the community if given to non-profit groups in the area that are promoting the arts, continuing the original intent of the organization to the next generation. 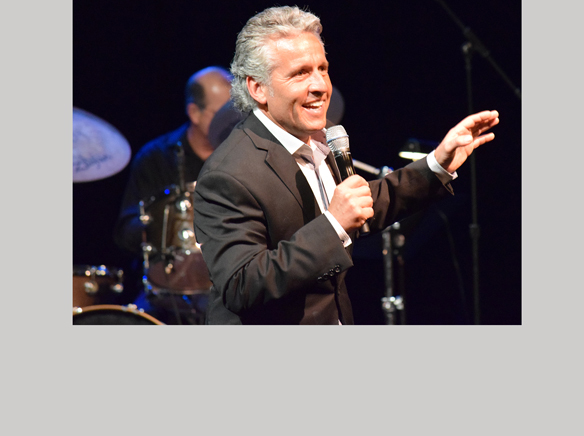 Singer-crooner Brian Roman delivered an array of songs from legends Frank Sinatra, Dean Martin, Sammy Davis Jr., Elvis, Engelbert Humperdinck and engaged the crowd in melody and his dynamic on stage presence. Throughout the audience married couples smiled, or tenderly touching each other’s shoulders in recognition of songs that took them back in time to a particular moment in life. Roman, who started singing at 42 in Toronto, after years of selling life insurance ably encapsulated the moods of the time and commanded all the vocal ranges needed bringing back to life much of the music that shaped America’s music industry forever. Roman’s dance moves reflected the Elvis’ hips, the Louis Prima’s (The Jungle Book) swinging bounce dance, Tom Jones’s audacity and other crooners’ mannerisms as he slid across the stage and out into the audience. This bestowed an authenticity to each number, while preserving his fun, lovable personality. Roman, who will be adding new songs to his repertoire and a new CD in the near future, epitomized the sophistication of the mid 20th century. It was this style, variety, personality and pure love of music that made Roman its choice for its final performance. This was a repeat performance for Roman having performed in the 2014-2015 season and being so well received. His story is as entertaining as his performance, as he always loved to sing, but did not decide to do so until his early 40s. And he did it grandly. Roman booked Toronto’s Roy Thompson Hall, home of the Toronto Symphony, and through months of “peddling” tickets everywhere he went, sold out entire venue and performed before the public for his first time. Roman was humbled at the opportunity that the GCCA gave him by performing the last act of such an incredible organization. “Tonight the compliment you have paid me to do your last show is an honor,” he said. Delivering such outstanding artists for so long when no other group in East County did is astounding, and that is what the Grossmont Community Concert Association accomplished over the past 70 years. Keeping its vision still intact, the East County Youth Symphony greeted guests as they came to the show. Although the Association might have had its last show, its work and its influence live on. This is one performance and a lifetime for the love of arts and the community that its members live in. This is one for the history books.